She did it. She dreamed it, she worked hard, she sweated, and she cried over it. And most of all she did it. When Maddy was a kindergartner, she came home and told me about the cheerleaders who had come to her school for a pep rally, and how one day she would be one of them. Dreams are a big thing for me, and and I am not about crushing them. I looked in those huge chocolate eyes of hers and I smiled. On the outside I said, "Yes, you can do it." On the inside I said, "Oh no. I know nothing about cheerleading." Soccer? yes. Tennis? you got it. Cheer? not so much. So I worked hard on her, and and she worked hard on me. Let's sign you up for a soccer team, Maddy. She played and she scored a goal for the other team, but I didn't have the heart to tell her as she ran down the field jumping and leaping in the best celebration you could ever imagine. How about volleyball, Maddy? She signed up and did cartwheels on the back row and handstands during the time outs. How about cheer, mom? Maybe later, Maddy. How about basketball, Maddy? Maybe later, mom. How about tennis, Maddy? She took to the court and looked gorgeous in that little tennis skirt that she had picked out, but she wasn't too concerned about making contact with the ball. How about gymnastics, mom? I think I can hang with gymnastics, Maddy. How about cheer, mom? Ok Maddy, you can try cheer. All of a sudden, her jumping, leaping, cartwheels, handstands, and ability to look great in a short skirt came in handy and my heart whispered to me, "You should have listened to her all along". For eight years the kid worked. 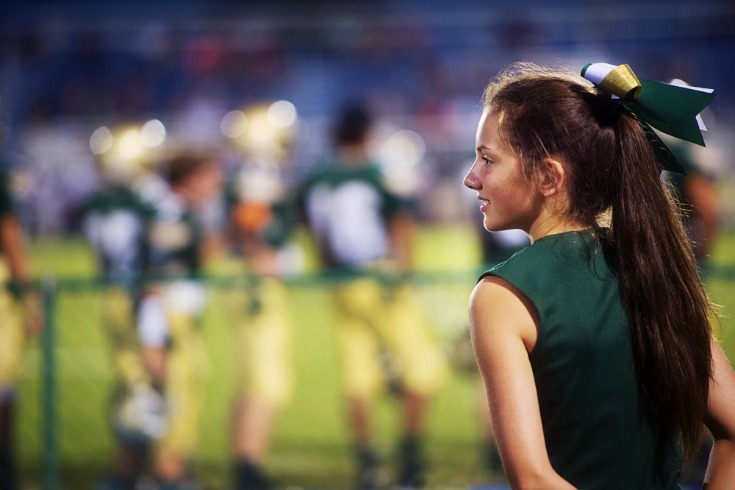 She made the cheer squad at her middle school and worked even harder the next year to make the football cheer squad. Yesterday, her squad went back to her old elementary school to do the same pep rally that she had told me about so many years ago. I saw the kindergartners abandon what they were doing on the playground to watch the big girls arrive, looking at them as if they were stars strolling up on the red carpet. The crowd of girls grew and a few of them knew Maddy and called out her name as the squad warmed up. These little wide eyed girls jumped and waved frantically just in case Maddy would look over at them. And when she did, they looked so proud to know her. Through tears, I saw life come full circle and was amazed at the magnitude of what Maddy had done. 8 years plus a wish, a goal, a plan, and a lot of hard work and she had made one of her dreams come true.